This book is used in conjunction with our workshop as well. In 1923 Claude C. Hopkins composed the book “Scientific Advertising.” At the time this work revolutionized how businesses were to market their products and services to potential customers. Its principles still hold true in the new millennium. Its content continues to be applicable. 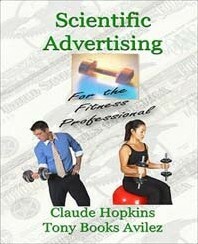 Scientific Advertising for the Fitness Professional is a new and targeted spin on an old classic book. Fitness professionals are taught how to train, not how to market. This book takes timeless information from the original and makes it relevant to today’s fitness professional. Reading this will open your eyes to the modern secrets to guarantee success in the field of fitness. Claude Hopkins invented test marketing, sampling technology and the concept of pre-emptive advertising. Advertisers have used the concepts revealed in this book successfully for decades. Tony Books Avilez is a nationally recognized fitness professional as well as the author of 5 best selling fitness books. He has created systems to help other fitness pros.